SOLAR POWER ALTERNATIVE ENERGY Columbus,Ga. 1 5-IN-1 Survival Whistle with Lanyard , Compass, Mirror,Waterproof Container, Flint. Non-Woven Gauze, 2x Alcohol pad, 5x Bandages, 10x Cotton swabs 2 Iodine Cotton Swabs. All Kits Do Not Include Food, Flammable Liquids or Conventional Weapons. These Items Along with Important Documents Can Be Added According to Your Needs. 1 5-IN-1 Survival Whistle with Lanyard, Compass, Mirror, Waterproof Container, Flint. Note: Contents Can Be Transferred and Bag for Kit is an Insulated Waterproof Cooler Bag. Insulin and Other Perishable Refrigerated Items May be Stored for Hours or Days with Ice Packs or Similar Keep Cold Alternatives. GOLF CART KITS AVAILABLE IN 400 WATT 48 VOLT & 300 WATT 36 VOLT. 100 WATT MONO-CRYSTALLINE SOLAR PANELS. CHARGE CONTROLLER IS 99.5% EFFICIENT AND EVEN BRINGS OLD BATTERIES BACK TO LIFE. EVERY CHARGE CONDITIONS AND MICRO- EQUALIZES THE BATTERIES WITHOUT DAMAGE OR OVERCHARGING & GASSING. BEFORE ORDERING: CHECK BATTERY VOLTAGE OF EACH BATTERY FIRST TO MAKE SURE YOU DON'T HAVE A SHORTED CELL! THIS KIT WILL BRING YOUR BATTERIES BACK TO LIFE ENOUGH TO PLUG THEM BACK IN. MOST GOLF CART CHARGERS WON'T WORK IF THE BATTERIES ARE BELOW A CERTAIN VOLTAGE. AFTER A FULL CHARGE 6 HOURS OF FULL SUN A DAY IN A FEW WEEKS YOU MIGHT NOT HAVE TO PLUG IT IN AT ALL (Except with heavy use). The Air1.Solar Golf Cart Kits. AS400W48V 400 WATT 48 VOLT Kit. AS300W36V 300 WATT 36 VOLT Kit. All you need are a few tools and a drill. Roof and Lay Out the Mounting Rails on the Roof. Attach the L-Feet to the Rails. Pitched Dome with 2 Angles, the Rails can be Placed From 18" to 45" in Width. back. 3 100 Watt Solar Panels Mounted are 48" Wide & 66" From front to back. Really Cool and will Not RUST. Hex Wrench Included in Kit. Please call 706-689-0000 with any Questions. 400 Watt Solar Powered Golf Cart Kit. 4 100 watt mono-crystalline solar panels. 1 48 volt 25 amp charge controller pre-wired with MC4 panel connectors & battery hook-up with disconnect. All mounting hardware included. Digital voltmeter included. BATTERIES NOT INCLUDED. 300 Watt Solar Powered Golf Cart Kit. 3 100 watt mono-crystalline solar panels. 1 36 volt 25 amp charge controller pre-wired with MC4 panel connectors & battery hook-up with disconnect. All mounting hardware included. Digital voltmeter included. BATTERIES NOT INCLUDED. The Air1 Solar AS400W48 & AS300W36 Solar Powered Golf Cart Kits. Complete solar powered golf cart kits. Includes 100 watt mono-crystalline solar panels. 1 25 amp charge controller. All cables needed to hook-up to solar panels & batteries. All mounting rails & hardware included. Batteries NOT Included. This charge controller has been documented bringing bad batteries back to life.This kit may not cure your BAD BATTERY problems but, this controller conditions the batteries without gassing them and micro equalizes on every charge and can increase battery life up to 75%. The batteries chemical process actually control the charging. Before buying this kit, have your batteries checked so you can see the results for yourself. The charge controller is 99.5% efficient. Everything you need is included. It should take 4 to 6 hours to completely install this kit. Digital voltmeter included, lets you park in the optimum position for improved charging. Please Go to a Professional! DO NOT INSTALL THE SOLAR PANELS IN THE SUN! THE PANELS ARE MAKING POWER IN THE SUN AND CAN CAUSE A FIRE, INJURY OR WORSE! We assume no liability or responsibility for any installation or use of this kit in any way. Make sure the cart is turned off and no load is on the fully charged batteries. Cart should have brakes applied and no combustible materials or liquids in the area. Find a place in the battery compartment to mount the charge controller. Make sure all leads including the solar panel connectors, will reach when picking the spot. Connect the 2 negative wires to the negative battery terminal. Next connect the disconnect breaker in the off position to the positive terminal. It will spark a little on connecting. You might need a stand-off terminal on some batteries. Find the center of the roof. Lay out the rails to size up placement and overhang if desired. Use the foam from the solar panel box as a template for spacing. Connect the L feet to the rails hand tight. for best results position L feet in the center at the lowest position and the front and rear at the highest position. Drill the holes as close to the front and back for greater flexibility, such as an overhang in the back. Use the end rail clamps to position the center panels for position. Substitute with mid rail clamps when adding the other panels. Add front and rear panels and lock down with the end rail clamps. Some rail kits are longer than shown in photo. If the rails don't reach, longer bolts with washers or vibration isolators can be added to accommodate your roof. Connect the panels in series starting with the shortest MC4 cable to it's mate to make sure all connectors will be long enough. Make sure you have the series connections right before connecting. It takes a special tool to unplug them easy! We recommend to install panels in the evening out of the sun and in the morning look for the green light. Park in the sun and check the meter for optimum angle. This kit is perfect for golfing, urban use and especially hunters. It even brought these old batteries (shown) back to life without having to plug in the AC charger for weeks. 6 hours of full sun is required for best results. Morning sun towards solar noon till 3pm or 4pm is desired. The setting sun is further away and has less charging power. THIS MOUNTING HARDWARE IS SLICK AND WILL NEVER RUST! 6mm HEX WRENCH REQUIRED. BLOG: WE FIELD TEST THESE SYSTEMS IN THE REAL WORLD! IMAGES BELOW SHOW 1.7K SYSTEM IN THE GEORGIA SUN. 190 WATT MONO CRYSTALLINE SOLAR PANELS 24 VOLT MC4. EDISON NICKEL IRON BATTERY BANK. 24 VOLT SERIES. REBUILT CIRCA 1906-1908.SOLID COPPER COOPER CONNECTORS. OFF GRID SOLAR POWER FIELD TESTS ARE HERE. 8 100 WATT PANELS. 4 MONO CRYSTALLINE (TOP) 4 POLY CRYSTALLINE (BOTTOM). MIDNITE SOLAR BREAKER BOX AND LIGHTNING ARRESTOR. TROJAN T-105 RE 6 VOLT BATTERIES WIRED 24 VOLT. SAMLEX 2000 WATT PURE SINE WAVE INVERTER 24 VOLT. BOTH 12 VOLT AND 24 VOLT REMOTE SYSTEM MONITORS. AUTO INDUSTRY QUICK DISCONNECT BREAKER. THIS IS THE 12 VOLT SYSTEM TESTED and RE-CONFIGURED SEVERAL TIMES. ORIGINALLY 4 100 WAT POLYCRYSTALLINE WERE OK BUT AFTER ADDING 2 MORE MONO CRYSTALLINE PANELS, (FROM 1 STRING OF 4 TO 2 STRINGS OF 3) THE BZ CONTROLLER (LIMIT 500 WATTS) AND THE 12 VOLT RAMSOND PURE SINE WAVE INVERTER SEEMED MORE SUITED FOR AN RV OR CAMPING. SHOWN IS 3 100 WATT MONO-CRYSTALLINE AND 4 100 WATT POLYCRYSTALLINE ARRAY. (NOTE THE ODD PANEL WAS USED FOR ANOTHER TEST FOR A SMALLER 12 VOLT SYSTEM). NOTICE THE SOLAR POWERED MOTION ACTIVATED WIRELESS CAMERA. ALSO THE SMALLER 12.6 WATT PANEL FOR SOLAR POWERED ATTIC FAN. 6 TROJAN 6 VOLT T-105 RE-WIRED SERIES/PARALLEL 12 VOLT FOR 660 AMP HOURS. This SOLAR Off-Grid System Was Just Converted From 12 to 24 Volt. ON ANY CHARGE CONTROLLER, HOOK UP THE BATTERY TEMPERATURE SENSOR. SAVE YOUR BATTERIES FROM OVERCHARGE BURNOUT! WHEN BUYING ANY INVERTER MAKE SURE THE VOLTAGE IS 120 VOLT. DON'T BE FOOLED BY 110 VOLT OR 115 VOLT RATING. THE plus or minus 5% CAN DROP YOU VOLTAGE AS LOW AS 106 VOLTS AC WITH NO LOAD. Pay attention to the Inverter's specs. 24 volt and 48 volt systems are more efficient than 12 volt. The larger 24 volt and 48 volt systems can have single phase (2 hot legs) power in 1 unit. I don't recommend stacking inverters. THIS 4 100 WATT POLY CRYSTALLINE ARRAY WORK WELL WITH THE 12 VOLT SYSTEM. ANY INCREASE IN PV WATTS IS MORE EFFICIENT GOING TO 24 VOLTS. TESTING MPPT VS PWM ON THE SAME PANELS, MPPT IS BETTER! SCHNEIDER (TRACE) C40 PWM CHARGE CONTROLLER WITH REMOTE AND BATTER TEMPERATURE SENSOR. 2 6 VOLT TROJAN T-105 RE IN SERIES TO 12 VOLT CONFIGURATION. MODIFIED SINE INVERTER FROM SAM'S CLUB. NOTICE BREAKER FOR BATTERY QUICK DISCONNECT. This DIY SOLAR PANEL ARRAY was finished just in time. The day I completed all hook-ups and charged the 6 Trojan T-105RE Batteries, A Storm came up and the grid power went out. My basement leaks during flash flooding and is one of the reasons for the need for an alternate power source. Just as the rain and hail came down in buckets, it was hard to believe the panels were still charging the batteries (MPPT). Then my basement started leaking. I hadn't planned for this to be the test, but I plugged in a light and my shop vac and kept my basement from flooding. Now I have a fail safe for my sump pump and small power needs. I'm waiting for technology to affordably redo my roof with PV Roof Material. I DUG THE HOLE EVEN AFTER THE 4 FT DEEP 80 FOOT FRENCH DRAIN TO PUT IN A SUMP PUMP. AFTER SEVERAL AC PUMPS STILL NOT STOPPING THE LEAK ON AC, I DECIDED TO DIG DEEPER AND GO 12 VOLT NOTE THE 12 VOLT SYSTEM WITH A MARINE BILGE PUMP AND FLOAT SWITCH KEEP THE WATER PUMPED OUT OF THE HOLE WITH A HEAD OF 6 TO 7 FEET. WHEN IT DOWNPOURS THE BASEMENT STILL LEAKS. THE HOLE FILLS VERY QUICKLY WITHOUT THE PUMP. THE UNDERGROUND WATER TABLE RISES IN THESE HILLS. THIS SYSTEM HAS BENN GOING SINCE 1997. A 400 WATT WIND TURBINE WAS ADDED RECENTLY. THE BP PANELS ON THE LEFT WERE MANUFACTURED IN 1997. THE 100 WATT MONO CRYSTALLINE PANEL ON THE RIGHT WAS ADDED LAST YEAR WITH THE MIDNITE SOLAR BREAKER BOX AND LIGHTNING ARRESTOR.. 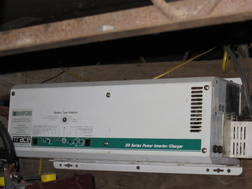 TRACE (SCHNEIDER TODAY) CONTROLLER AND MODIFIED SINE WAVE INVERTER HAVE PASSED THE TEST OF TIME UNDER THIS MOBILE HOME ON 100 ACRES AS SOLE POWER SOURCE. THE TROJAN L-16 RE B BATTERIES WERE A SOLID INVESTMENT FOR 2013. CUSTOM ARTICULATING PANEL ARRAY FRAME by VETERAN GLASS. NOTICE ADDING 2 MORE 100 WATT PANELS TO THE ARRAY. THE WIND TURBINE AND ALL 6 PANELS POWER THE 24 VOLT THE OFF-GRID CABIN SYSTEM. THE SHED SYSTEM HAS TWO 1997 UNI-SOLAR PANELS, 24 VOLT FLEXCHARGE CHARGE CONTROLLER & THREE 8 VOLT GOLF CART BATTERIES. THIS SYSTEM IS 24 VOLTS. NO 120VAC INVERTER. 24 VOLT 3450 LUMENS OUTDOOR LED LIGHTS ARE VERY, VERY BRIGHT! POLE MOUNT KIT UP TO 3 PANELS. 360 DEGREE SWIVEL X & Y AXIS. Solar Heater Warms Air to Heat House. Mike Daniels Design.